It’s about time to wrap up this expedition and leave Swaziland for this time. We had our last day in the cave yesterday, when we also spend some time on the surface together with Darron. We started by visiting the place where the river flows out after nearly 2kms underground. It’s a quite large river, being one of the most dry winters for years. It seems more and more obvious that this river has a significant role in the genesis of Gobholo Cave. After that we wanted to take a shortcut up the side of the valley, ending up chasing almost invisible animal tracks through the thorny bushes and shrubs. Finally we found the almost 13m deep hole Manu and I found the day before just beside the track up the slope, and after some more searching we located an alternative, more easy entrance down to a new, small but quite beautiful cave with water eroded passages through two layers of granite. It’s only 100m long, perhaps even less than that, but shows that Swaziland have other significant caves than Gobholo cave. From there we walked back towards the main entrance of Gobholo cave, to have a look at some small entrances that Manu found the week before just upstreams the “normal entrance”. Some searching revealed one that lead steeply down; I followed that one for perhaps 50m and to a depth of 10+m, turning in a continuing walking passage, leading steep down. It will be very interesting to find out where it connects to the main system, my guess right now is somewhere close to the “thermal bath”. In Gobholo cave we got company with T and C, and went down to the river doing some exploration on the route. Darron found a short sidepassage, ending in a 2m climb down to a mudfilled chamber with some graffiti that we blamed on the british cavers that rumors will have it to have visitied the cave in the 60’s (anyone know about them?!). The solution to the graffiti come only a few hours later, involving no brittish cavers at all… (apologies to all brittish cavers!). We also collected the last few unlucky cave spiders, but the small milliped was more lucky and escaped. 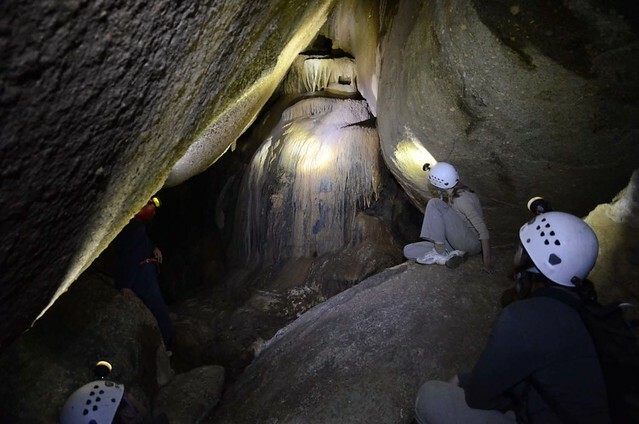 The Swazi-Swedish Gobholo Cave Expedition will thus not end only because we leave Swaziland on Saturday; with us we have samples of both speleothem and cave life that will keep us (and other) busy for some time. After the cave we were invited to T for dinner with some of her friends, and there this guy, let’s call him J, admitted to have been in the cave together with another friend (“E”), where they found “the bottom of the cave” — “at least half a kilometer down”, where they had written their names in the mud in a chamber, and draw a smiling face. The british cavers were only some adventurous locals… Funny coincidence though, to find that chamber the same day as we met its previous explorer! And finding out about it! The dinner was great, with a lot of good food, some interesting and good-tasting swazi food and a delicious curry. Many thanks T for this great last night at the cave!